Defined as thin cuts of meat, sauteed and cooked in a rich sauce, the scaloppini technique for cooking pork, chicken and veal is simple and elegant. Lemon, garlic, thyme, rosemary, parsley and white wine all meld together to form a succulent sauce with the renderings of the thinly sliced pork cutlets. Why pork for this dish? Well, who doesn't want a break from chicken sometimes? 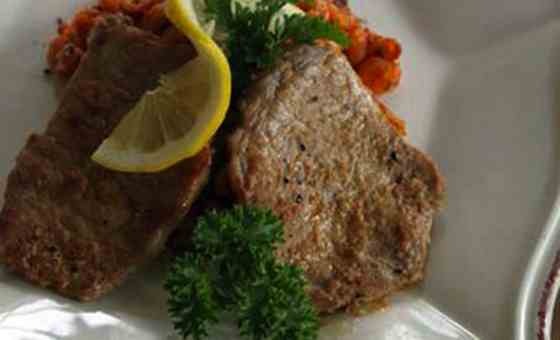 Veal, of course, is a luscious choice for scaloppini, but many have an aversion to it. In any case, pork cutlets work marvelously. This cut of meat is economical, easy to handle and the perfect portion to plate. It browns well, yielding that flavor as a delightful element for the sauce. Ah, the sauce! I tend to crave a beurre blanc sauce, relishing that phenomenal combo of lemon, garlic and wine. Once the cutlets have browned, a hearty splash of good white wine deglazes the pan, forcing those browned bits of meat and garlic to relinquish their hold on the skillet's bottom and bond together with the wine. Letting the wine simmer and reduce concentrates the flavor of liquid and helps tenderize the meat. A liberal squeeze of lemon gives a tangy, citrusy, floral note -- what joy! One way I like to serve my pork scaloppini is on a bed of fun macaroni covered in a sauce of crushed tomatoes, parmesan and garlic. I love how the wine and lemon enhance and complement the tomato sauce. I'm addicted to roasted cauliflower, so I like to serve it with this meal. Coat thinly sliced cauliflower with olive oil, salt and pepper, and then roasted -- fabulous! I've roasted about everything I can, and cauliflower is simply the best. This meal is simple and elegant, easy to prep and plate, and full of flavor bursts and complementary textures -- and pretty enough for company! Heat the oil in an iron skillet or saute pan until hot, patting the pork cutlets dry with paper towels in the meantime. Place the cutlets in the oil and watch them sizzle and brown, salting and peppering the exposed side and spreading the garlic on the meat too. Flip the cutlets after two minutes or when the meat easily releases from the pan. Season the now upturned brown side and cook for another minute. Add the white wine and allow the pan to deglaze and the wine to reduce by half. You may have to scrape some of the browned bits from the bottom of the pan if the wine doesn't release them. Flip the cutlets again and again if need be to keep them moving and the sauce turned. Once the wine has reduced, squeeze the lemon juice over the pork and remove from heat. Add the herbs of your choice for savory, green flavor and serve over warm pasta, risotto, mashed potatoes, or peas, or with steamed or roasted vegetables. Garnish with parsley and lemon. Since we eat with our eyes first, it's fun to see the flavors before we've tasted them! Enjoy!